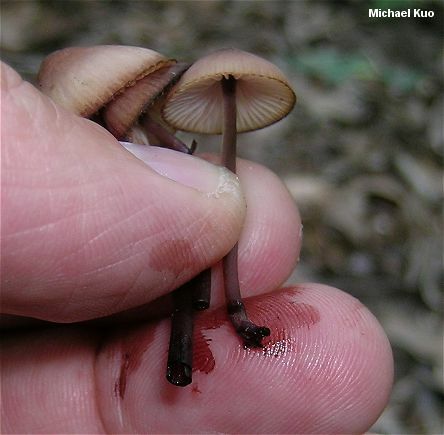 If you combine blackberry picking with your mushrooming, you may not notice the feature that defines this little mushroom: it exudes a purplish juice that stains your fingers. Sometimes called the "bleeding mycena," Mycena haematopus is one of the few Mycena species that is easily recognized. The purple juice comes out readily when the mushroom's flesh is squeezed--especially in the base of the stem. 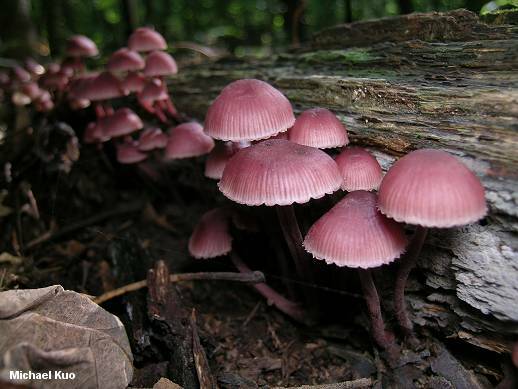 Mycena haematopus grows in clusters on the deadwood of hardwoods, which helps to separate it from another bleeding species, Mycena sanguinolenta, which grows scattered or gregariously on the ground in conifer woods. 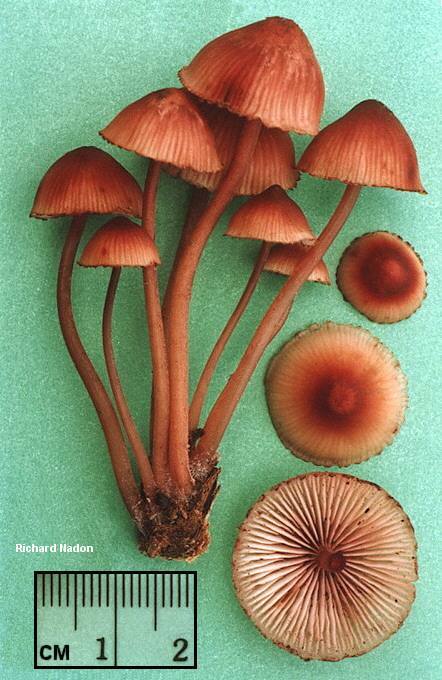 Smith (1947) records Mycena haematopus var. 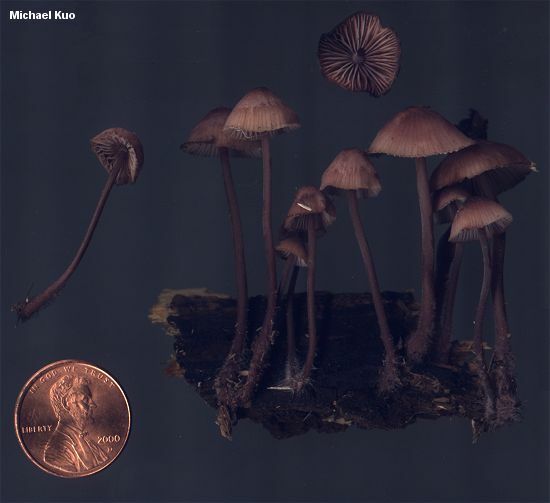 marginata, with reddish gill edges and spores 9-12 x 6-7 µ. Mycena haematopus var. cuspidata features a sharply conic cap and grows on the deadwood of quaking aspen in the Rocky Mountains. Ecology: Saprobic on the deadwood of hardwoods (rarely reported on the wood of conifers), usually on logs that are well decayed and without bark; growing in dense clusters (but sometimes growing alone or scattered); causing a white rot, according to Tom Volk (click the link below); spring through fall (and over winter in warm climates); widely distributed and common in North America. 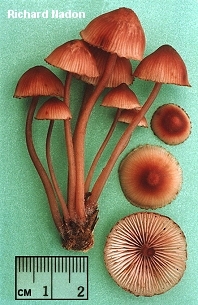 Cap: 1-4 cm across; oval, becoming broadly conic, broadly bell-shaped, or nearly convex; the margin often with a tiny sterile portion, becoming tattered with age; dry and dusted with fine powder when young, becoming bald and tacky; sometimes shallowly lined or grooved; dark brownish red to reddish brown at the center, lighter towards the margin; often fading to grayish pink or nearly whitish. 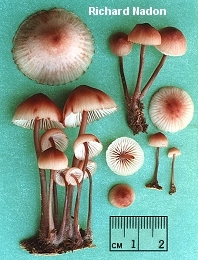 Gills: Narrowly attached to the stem; close or nearly distant; whitish, becoming grayish to purplish; often stained reddish brown; edges colored like the faces. 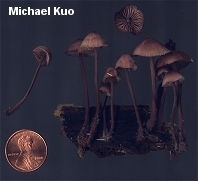 Stem: 4-8 cm long; 1-2 mm thick; equal; hollow; smooth or with pale reddish hairs; brownish red to reddish brown or nearly purple; exuding a purplish red juice when crushed or broken. Flesh: Insubstantial; pallid or colored like the cap; exuding a purplish red juice when crushed or cut. Microscopic Features: Spores 8-11 x 5-7 µ; broadly elliptical; smooth; weakly to moderately amyloid. Cheilocystidia abundant; fusiform, with elongated, subacute apices; up to about 80 x 12 µ. Pleurocystidia absent, scattered, or frequent; when present similar to cheilocystidia. Pileipellis a cutis, with the uppermost elements diverticulate. REFERENCES: (Persoon, 1800) Kummer, 1871. (Fries, 1821; Saccardo, 1887; Kauffman, 1918; Smith, 1947; Smith, Smith & Weber, 1979; Arora, 1986; Breitenbach & Kränzlin, 1991; Phillips, 1991/2005; Lincoff, 1992; Barron, 1999; McNeil, 2006; Miller & Miller, 2006; Trudell & Ammirati, 2009; Kuo & Methven, 2010.) Herb. Kuo 09029511, 08270201.